Summit provides software solutions for Rich Communication Services (RCS), social networking applications, multi-platform eCommerce/mCommerce/vCommerce, Connected Living enabling mHealth & wellness, Cellular IoT (IoT, IIoT, M-IoT), smart home, smart cities, and next generation virtual reality / augmented reality integrated with IMS & Rich Communication Services. Whether it is GSMA Enriched Call or RCS Universal Profile, maybe you deploy messaging based on OMA SIMPLE IM or OMA CPM, your network may support single or dual mode RCS registration, in all cases there are many options to consider. Your network may integrate VoLTE presence (UCE), SIP OPTIONS or both, maybe your device strategy is based on embedded implementations or Telco-OTT apps (or you wisely choose both, with support for secondary devices such as tablets, laptops, smart speakers/digital assistants etc). Your device team will target platforms; Android™, iOS® , Windows® or Linux - primary devices as smartphones and secondary devices as tablets, desktops, smart TVs, smart watches, virtual assistants and even Cellular IoT. Then there are web clients enabled through network APIs, terminal RCS APIs, WebRTC, gaming APIs, RCS MaaP/Chatbots and so much more. For all your requirements - there is but one truly multi-platform, industry accredited IMS / RCS SDK / client. VR Call: chat, voice and video call with users in remote locations while immersed in 360° live video streams or simulated VR/AR environments, from AR Conference Calls to VR Live Concerts. 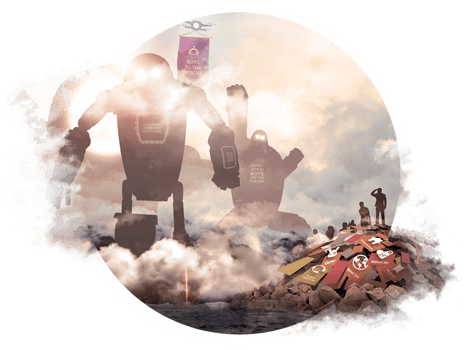 Summit's RCS Bot Connectors linking bot platforms with MNO RCS deployments enabling RCS Business Messaging for smartphones and secondary devices from tablets to smart speakers/digital assistants. Next generation A2P channel designed to enrich conversation, commerce and automation for airlines, banks, restaurants & retailers to healthcare, security & telematics. Complete solution from clients to bot platform servicing mCommerce, A2P and Cellular IoT—resulting in chatbots bridging natural human communication with automation and machine intelligence (MI). 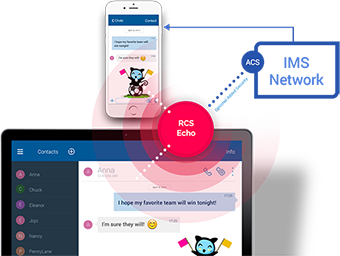 IMS Cloud solution for operators to rapidly and reliably launch Rich Communication Services starting with RCS chat—to RCS MaaP and chatbots for RCS business messaging, enterprise VoLTE including Ai Virtual Assistants, RCS Cellular IoT, XR/AR/VR mixed reality calling and beyond. With IMS and RCS, MNOs have an opportunity to provide new IP communication services which easily integrates with current services and offer advantages above and beyond over-the-top offerings. 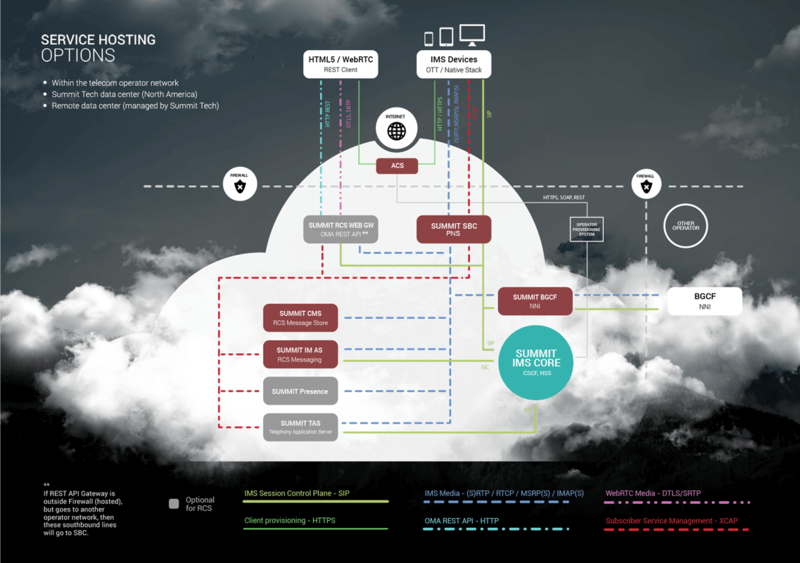 Paired with the Summit RCS client and support for RCS Universal Profile devices, the Summit IMS Cloud is designed to offer standards-based IMS services on your network with features surpassing the best OTT clients. Services can be ready to launch within weeks and extended progressively as needed. 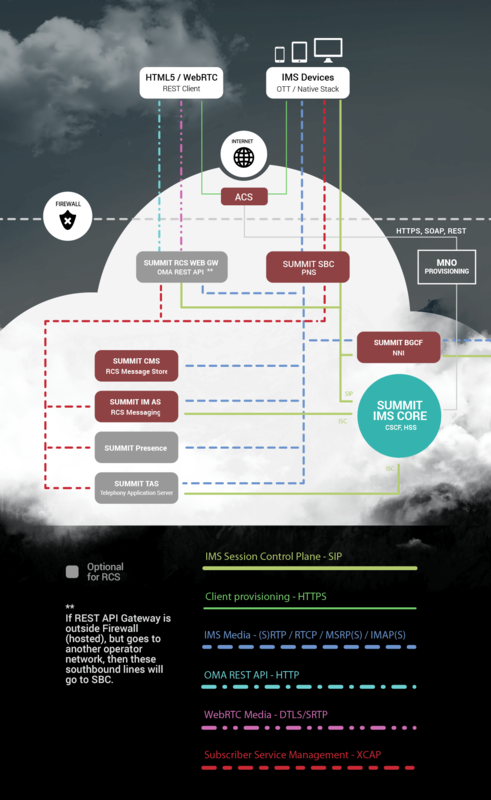 Summit's RCS Cellular IoT Connected Living - adding value to IMS/RCS networks. Automation integrated through IMS overcomes many challenging aspects of existing solutions deployed through proprietary platforms. No need to create user accounts with new usernames and passwords, simply connect it to a network, activate through your smartphone, and provision IoT devices. RCS Smart Home Hub unifies services across standards based devices such as LTE-M (Cat M1 / NB-IoT) with ZigBee, Z-Wave, Bluetooth and Wi-Fi, under one centralized service offered through a reliable, secure and standards-based provider - your telecom operator. Based on mobile identity, location or proximity, auto lock / unlock doors, retrieve status. Doorbells send notifications globally to family members resulting in real-time RCS Video Share session. Security cameras seamlessly integrate with your alarm system by activating home RCS Video Share sessions linked to emergency services when alarms are triggered. Through RCS messages and chatbots, your home environment system instantly notifies you of actions it will take to ensure efficient and cost saving operations. Family members can Arm / Disarm the system effortlessly with location push, e.g. when everyone’s away - arm the system, or through voice commands using Amazon Echo. Automate home lighting systems for ambiance, energy conservation and security. The Summit eCommerce Platform can be fully integrated with current retail systems; POS, ERP, carrier APIs, increasing end-to end efficiency in operations and support. RCS Business Messaging Mobile APIs for RCS Messaging as a Platform (RCS MaaP) and mCommerce enabled apps, including support for crypto currencies. 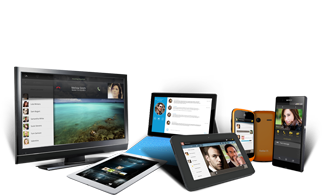 Custom Responsive Design adapts to desktops, smartphones, tablets and set-top-boxes. Supporting mCommerce, eCommerce, in-App purchases with innovation project for Mobile Payment. Why offer the same eCommerce template site as your competitor? Your brand is unique, so should your design. PS: your site needs to look good on all platforms. We'll make sure it does. We don't merely provide an eCommerce platform, we intricately and elegantly connect technology to your brand enabling your business to effectively compete in a "mobile-first" world. Our engineering and development teams can build and integrate the features you require when the business needs arises. You have a full tech team on your side. Native VoLTE / RCS client integration including GSMA Enriched Calling. 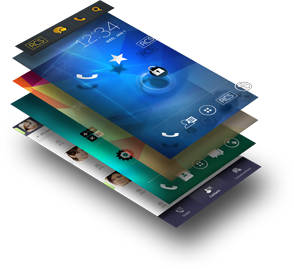 Embedded Smartphone solutions on Android, Windows and Linux, including fully integrated solutions for IMS/VoLTE conferencing systems and set-top-boxes. Rich Communication Services, chat (OMA CPM and SIMPLE IM), fileshare, VoLTE / VoHSPA / VoWiFi and IR.94 video calling integrated directly into core Android applications, including support for iOS CallKit. Enriched Calling support. Hardware optimized codecs, IMS APN, ISIM, AEC. BeamMeTo is an innovative VR CALLING live share IMS / RCS social networking platform that allows user to share live media streams, including VR/AR, with contributors and requestors in real-time through GSMA Rich Communication Services - RCS and Enriched Calling. Based on location or event, Beamers share real-time photos and video streams, including immersive 360 degree virtual reality (VR) video feeds with Oculus Rift users, HTC Vive, Samsung Gear VR and Google Cardboard. Beamers earn rewards/reputation based on accepted-video Share-sessions and community ratings. 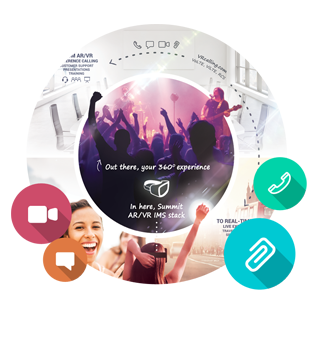 Incredible user experience by overlaying RCS Video Calling, RCS chat and fileshare directly on to 360 degree VR video streams (VR Call) based on RCS Location Share & Social Presence resulting in VR Calling support through standards based RCS and VoLTE devices. Easily develop value-added-services (VAS) with Summit's IMS API - through RCS 5.2, RCS 5.3, joyn Blackbird, Crane, RCS pre-universal, RCS Universal Profile, Enriched Calling and VoLTE. 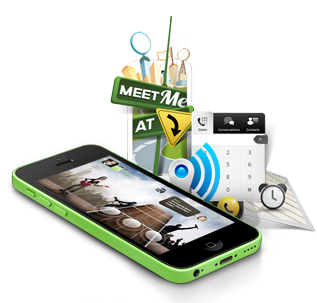 MeetMeAt : Location based RCS mini apps leveraging in-device APIs. A concierge scheduling & location service which auto-sends RCS notifications when you're en route or prompt you to notify others when you're late. RCS Widgets : High level mobile app RCS API accessible to 3rd parties. RCS Service Provisioning - Auto Configuration Server (ACS) The Summit Auto-Configuration Server (ACS) allows operators to easily deploy a scalable RCS provisioning solution. Current device management solutions can be complex to integrate with existing services across devices and platforms, ranging from smartphones, tablets, PCs to web clients. ACS (autoconfiguration server) shortens time-to-market and reduces risk on complex service deployments by focusing on an operator's specific RCS configuration requirements, including Mobile Device Management solutions. 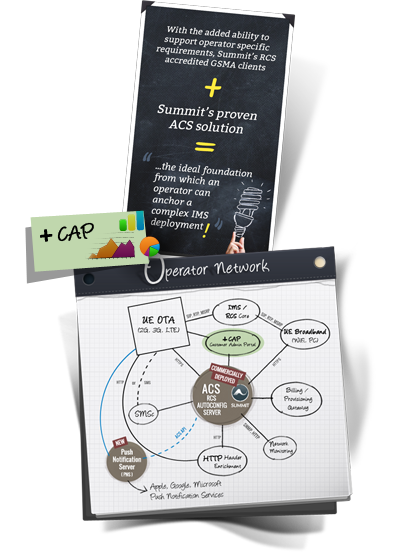 With the added ability to support operator specific requirements, Summit’s RCS accredited GSMA clients + Summit’s proven ACS solution = ...the ideal foundation from which an operator can anchor a complex IMS deployment. is an extension to the RCS Auto-Configuration Server (ACS) enabling real-time customer support services, engineering / testing tools facilitating trials and deployments, as well as a marketing and analytics engine. + Cap is the ideal tool for automated testing of IMS networks through the deployment of thousands of IMS probes (virtual clients) executing test cases from messaging, file transfer to voice and video calling, validating network functionality and scaling capabilities. 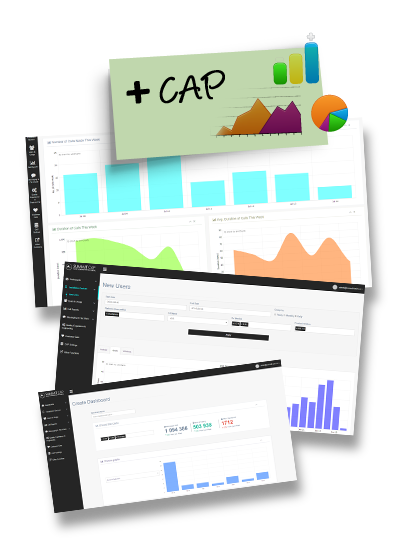 +CAP, improving Quality of Experience in IMS networks. The web chat service operators can quickly launch on any IMS network. Users simply link their Summit RCS mobile app with a web browser, then through their laptops or tablets, instantly send and receive messages through the web. For operators, the ability to deploy a simple and quick browser based chat service, extending RCS mobile users with multi-screen capability.